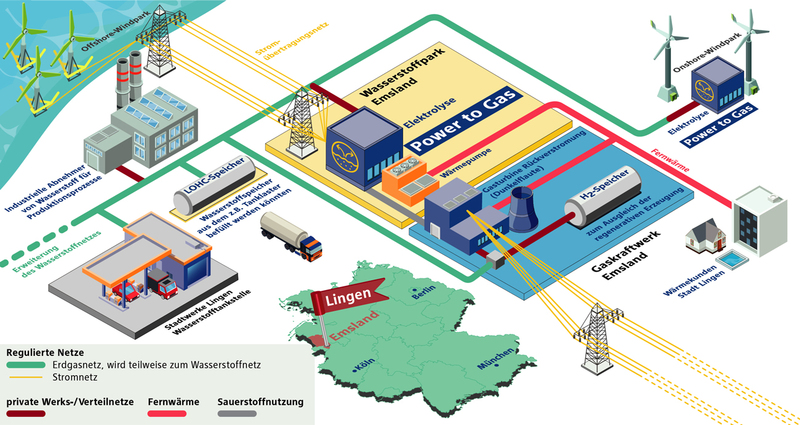 In the “Reallabor der Energiewende” competition for ideas, the partners in the GET H2 initiative are initially planning to set up a hydrogen infrastructure in Emsland that links the energy, industry, transport and heating sectors. A power-to-gas plant with an output of 105 MW is to convert electricity from wind power into “green hydrogen”. The transport and storage of pure hydrogen will take place in existing infrastructures. Existing gas pipelines will be used for this purpose. Storage and transport infrastructure for fossil fuels can also be deployed for hydrogen handling using Hydrogenious Technologies’ LOHC technology. Hydrogen will be consumed by customers in industry, mobility or by energy suppliers. “Renewable energy, electricity and gas grids, gas storage facilities and conventional liquid fuel infrastructure, right up to the customers for hydrogen and waste heat in the chemical industry: all this already exists in the region, so that the ideal conditions are in place for this innovative technology and fast project implementation. In Lingen, we can demonstrate the entire value chain on an industrial scale”, explains Roger Miesen, CEO of RWE Generation. Hydrogen is an important future building block for a successful energy turnaround. Electrolysis based on renewable energies will play a key role. By splitting water, electricity from wind and sun turns water into “green hydrogen”, an energy carrier that can make a significant contribution to reducing CO2 emissions far beyond the electricity sector, for example in the steel and chemical industries. “The decisive factor now is not only to test the technology in small R&D projects, but also to bring it to series maturity with larger projects in a holistic approach. The project has the potential to give the go-ahead for a hydrogen infrastructure for Lower Saxony and North Rhine-Westphalia, which can provide decisive impulses for a Germany- and Europe-wide hydrogen infrastructure,” describes Jörg Müller, Managing Director of ENERTRAG, the future perspective. “This is a worldwide unique project to show the way to sectoral integration with green hydrogen on an industrial scale. The re-electrification of 100% hydrogen in a gas turbine of the 60 MW class makes this a unique showcase project for power generation,” adds Prof. Dr. Thomas Thiemann, head of Siemens’ Energy Transition Team. The GET H2 consortium submitted a project outline to the German Ministry of Economics and Technology on April 5. A final decision is expected by the end of June. In two years’ time, the companies want to go into the concrete implementation of the project.